The Tiny House Toilet! It's one of the most important tiny house decisions you'll make. Living a “normal” life in a “normal” home, you’ve probably never given much thought to your toilet. It’s there when you need it, it does its job and it takes care of business with little muss or fuss. But when you live in a tiny house, your toilet becomes a big deal. Like, you’ll find yourself thinking about it, talking about and considering the various aspects of it A LOT. (And consequently - people start ASKING you about your toilets - A LOT!). It might sound a little ridiculous or even a little uncomfortable for some, but the fact is, when you make the transition to tiny living, you’re going to have to start thinking outside of the norm. And partaking in toilet talk will just be part of that journey. What’s the big deal about toilets? Well, it’s simple… first of all, if you want to be off-grid, you’re going to have to use an alternative to the traditional flush toilet, that’s just a fact. You can always upgrade down the line to solar panels and water catchment systems for your other utilities, but if you don’t plan for an alternative toilet from the very beginning, then you will always need access to a sewage hook-up. Plus, since most tiny house dwellers are concerned about the environment, they’re usually looking for an option that is more “green” and energy and cost efficient. First, let’s make it clear that if you DO want a traditional, flushing toilet in your tiny home, of course you can have one. (PS - we talk about ALL of this stuff in great detail - both from the plumbing and off-grid composting toilet perspective - in our live Virtual Tiny House Workshop, Design/Build/Downsize. So if you want to learn how to set up a DIY composting toilet for less than $50, or how to install your own tiny house toilet, come to our Virtual Tiny House Workshop!). Just like it sounds, RV toilets are made for use in campers and recreational vehicles. They usually use a minimal amount of water per flush and hold the waste in a holding tank within the unit. The tank does generate blackwater and will need to be emptied or be hooked up to a sewage system. However, the experience of using an RV toilet is familiar and very similar to a standard toilet and is used by lots of people. I personally do not like having to deal with black water tanks - in my personal experience, they are much more unpleasant than a composting toilet. You have to dump them, drain them, and maintain them with lots of chemicals. The most cost efficient toilet option for a tiny house is a homemade composting toilet. The toilet can be made easily and inexpensively by simply placing a toilet seat on top of a large bucket and adding sawdust to the waste after each use. The waste is then emptied into a compost pile where it is broken down naturally. Although the process does take a little getting used to and you will need to maintain a supply of sawdust as well as a suitable outdoor area for the compost pile, it is an inexpensive option that requires no plumbing or sewage hook-ups and allows you to recycle the waste once it turns into compost material. If you don’t mind spending anywhere from $900 to over $2000 on a toilet, you can purchase a composting toilet that will do all of the work for you. There are two different types – a self-contained toilet and a remote toilet. The self-contained composting toilet can be quite large since it composts the waste in a container within the unit. They typically have fans and/or heating systems that reduce the odor and maintain optimal temperatures for the composting process. Remote composting toilets allow the user to install a rather “normal” looking toilet in the bathroom itself, while the composting container sits in a separate area, usually beneath or outside of the house. Although there may be high initial costs involved and a small level of maintenance will be required from cleaning the unit to removing the compost material, these toilets are a great option for the environment and an effective way to live off of the grid. The only issue is that these types of "commercially" available composting toilets tend to be too large for most tiny homes and campers. Another rather expensive option is the incinerating toilet. Also costing upwards of $1,500, incinerating toilets burn waste into ashes that can then be dumped into the trash. Although this option does not require plumbing or sewage hook-ups, it can create a noticeable odor and can also use a lot of energy to operate. That being said, there are definitely examples of tiny house dwellers using the incinerating toilet, such as the Minim House. A waterless or “dry” toilet is a fairly inexpensive option that also allows you to live without a plumbing or sewage hook-up. The toilet looks very similar to a standard toilet, although it is actually lightweight and movable. Once the entire cartridge of liners is used up, the seat is removed, the cartridge drops into a garbage bag and the entire thing can be thrown in the trash. Then you insert a new cartridge and repeat the process. Costing only around $400-500, the dry toilet is an affordable option for those that want to live off-grid but can’t (or don’t want to) have a composting toilet. The only downfall currently to these types of toilets is the cost and frequent use of the cartridges. 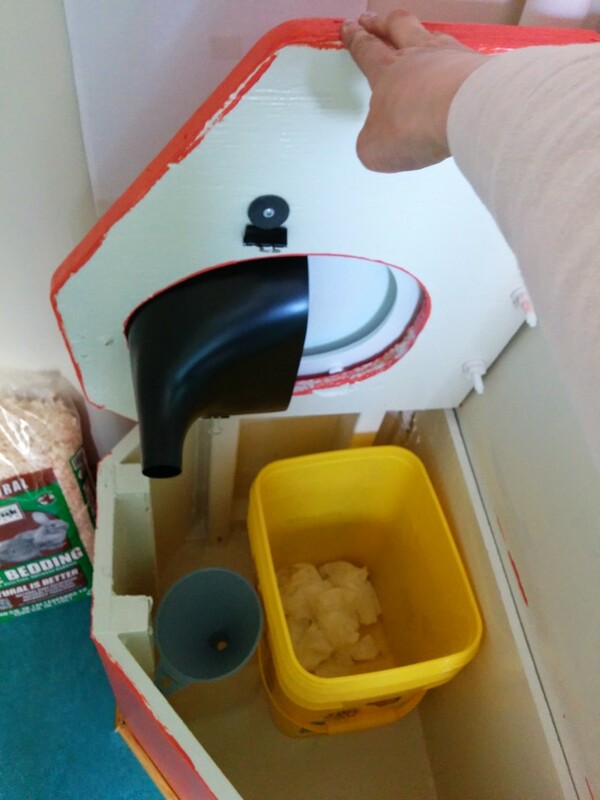 In the COMET Camper, we have a DIY composting toilet with a "cabinet", a square bucket, a urine diverter and a simple container for collecting and removing the urine (which we usually sprinkle on trees when diluted with water). It costs less than $50 to set it all up, and has worked great. (You can learn more about how I built it and get the instructions in our Virtual Tiny House Workshop). No matter what type of toilet you choose for your tiny house, the most important thing is that it works for YOU. Think about what your lifestyle is like, what your needs and desires are both economically and environmentally, and choose what will fit best into YOUR life.